Come join us on Wednesday Nights. 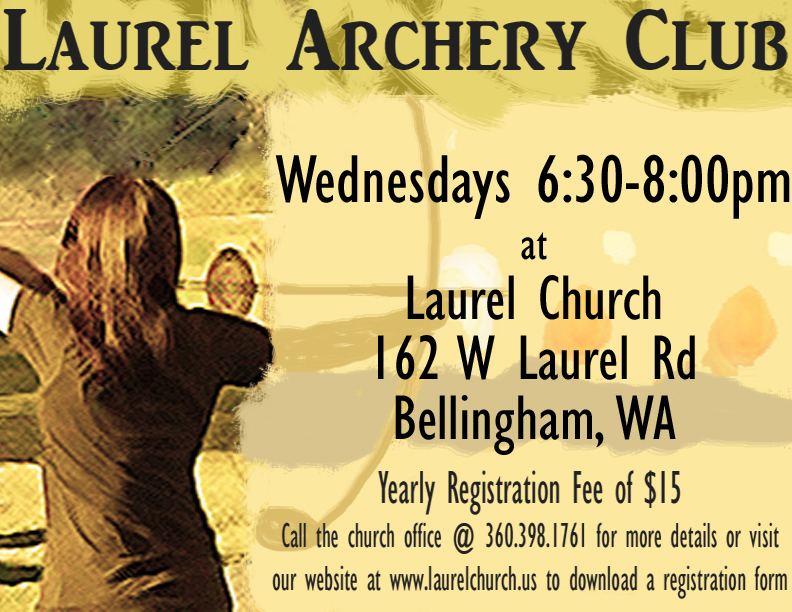 From 6:30-8:00pm we break out the bows and arrows at the Laurel Archery Program, in the sanctuary of Laurel Church with a special mesh screen, colorful targets, compound bows, etc. If you are able to pull a 10-20 lb. bow, you are welcome to join no matter what your age. John Rickenback began this ministry and it has spread to some 46 states. It is a shooting sport and one of the safest in the nation. Strict safety rules are followed and the best equipment provided. Our instructors went through intensive training with the NFAA (National Field Archery Association) course. Some of our instructors have been hunting with a bow for years. Both men and women instructors are present. This ministry teaches the basic fundamentals that will enable you to be an effective archer. If you choose not to listen and shoot your own way, you will not do as well. The same is true spiritually. Jesus said, if you build your life on a strong foundation and live your life according to His teachings, when obstacles arise, you won’t collapse or fail. You will be able to stay on target in life. We are praying that the ministry will help you shoot straight and hit the target with your arrows. Also, the Word of God will be taught that everyone might not sin, “miss the mark”, and always find the “bulls eye” on the target called “life”. There is a $15 yearly registration fee. Click here to download a registration form.